Our Chiropractors in work to realign the skeletal system of the physical body through careful manipulation of the spine when one or more vertebra is out of place. Chiropractic treatment in intended to relieve serious complications If you are experiencing stiffness, pain, spasm, decreased range of motion, numbness, headache, tingling or any combination of these symptoms then you most likely are suffering from a chiropractic issue and you need to call our office in for an appointment. 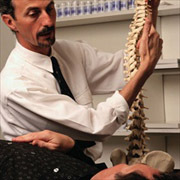 Call us now for an appointement and get PAIN RELIEF TODAY! I get upset when I think about my car accident in 4 years ago. I was driving home from a night out with friends, when I was stuck by a drunk driver. It changed my life. she was driving full speed and hit me from behind while I was sitting at a red light. I remember looking back into the rear view mirror as the car was approaching. The car didn't stop and I hardly had time to react. The impact was terrifying. I blacked out. I awoke with the paramedics hovering over me. I started to panic, they calmed me down and told me there were no external injuries, and asked me if I had any pain in my body. I let them know that my back was in serious pain. They had me move my legs and wiggle my toes. No paralysis, thank God. They took me to the emergency room and took an x-ray of my back, I had some hairline fractures on my tailbone and some of my discs had shifted out of place. The doctor suggested a dangerous sergical procedure to correct some of the issues it was either that or pain medicine while it healed. The thought of surgery had me thinking about my uncle. He had a bad back and had undergone alot of back surgeries. He lived from walker to wheelchair for many years. It was a painful thought. I had a cane to help me around, I felt like an old person and I was only 34! It went on like this for a couple of months. I couldn't stand it any longer. I figured surgery had to be better than this. I signed up to get my first surgery, and the thought of my uncle kept playing in my head. I don't want to live like that. My friend called me that I hadn't talked to in years. I mustered up enough energy to say hello. He wanted to grab some dinner, I let him know that my back wouldn't allow it. He was disappointed, but then what he told me was the first glimps of hope I had heard in a long time. He said, You're in luck Ray, My wife is a chiropractor. "She'll get you better in no time." His tone made me think he didn't not understand the severity of my condition. I tried to explain that this was past any help of a chiropractor, but he wouldn't listen. He set me up to meet with his wife Shelly the next day. I was intrigued, I never went to chiropractors cause I always relied on medical doctors. since Medical Doctors had failed me and I figured I"d try a different method. I walked into Shelly's office and Daniel showed up for moral support. Shelly took some X-Rays and did some diagnostics with me. She had me lay down, and started realigning my back. I heard a pop in my back and it was like a miracle, a weight on my back had. I felt it throughout my body. I literally had goose bumps. When she was done I got up with a grin on my face. I could feel something was different...Better. I had a huge list of questions for Shelly which she answered with a grace and patience like no other. She Actually took the time to listen to all my concerns unlike Dr. Joe Schmo who just wanted to get the best bang for his buck. She saw my hope and enthusiasm, to which she told me that she would have me walking like before in a few weeks. I was so happy with my first visit I cancelled my surgery. I continued my treatment with them and I still go at least once a week. I don't walk with a cane anymore, and medication is a thing of the past. Somebody up there heard me.